Tyler’s class is having a Japanese tea today, and I thought it would be fun to make an ultra kid-friendly sushi for them. 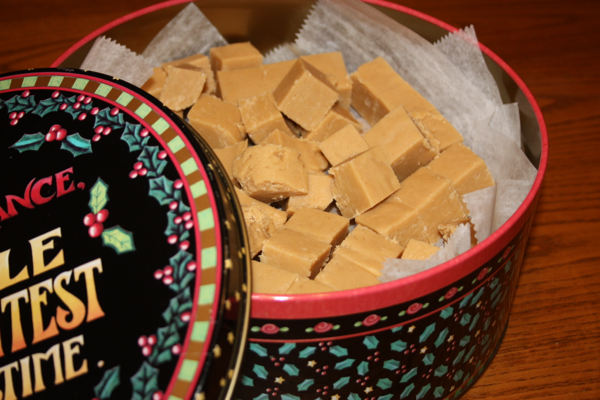 I originally made this treat when William was in kindergarten and his friends loved them. I know this desert tastes nothing like real sushi and that’s ok. Tyler was so excited about taking it because it is fruit roll-ups, gummy worms, and rice krispies treats. How can a kid say no to that? Whether or not you enjoy “real” sushi, I am sure that the kid inside you will enjoy this variety. 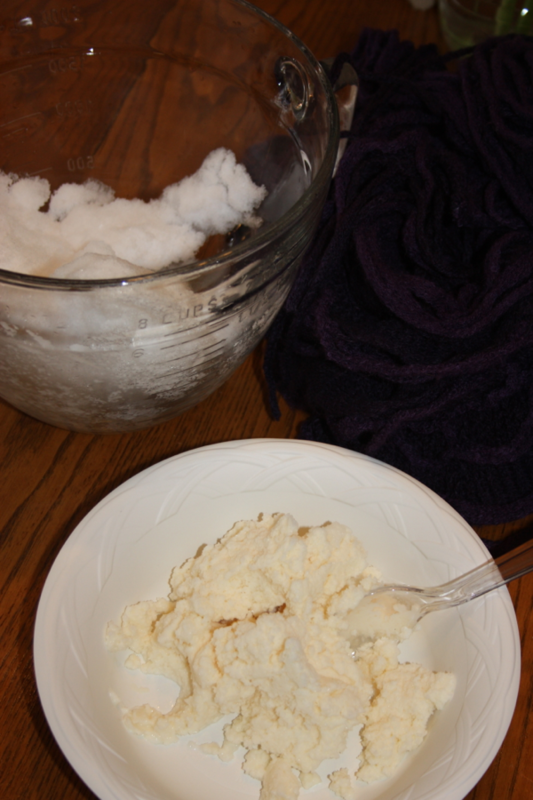 If you have kiddos at home it makes a wonderful activity on a cold snowy day or any day for that matter. I love when my children will come into the kitchen and help. Tyler is one who normally enjoys helping, but if the fruit of our labors is more enticing William even likes to venture in and give a hand. I hope you enjoy this whimsical recipe. I am sure you can find an excuse to make a batch for friends and family. What is one of your favorite whimsical desserts or treats? Spray a sheet pan with non-stick cooking spray. Set aside. Melt butter in a medium saucepan over low heat. Add marshmallows and stir until they are melted. Add the rice krispies and stir until they are thoroughly coated with the marshmallow mixture. Pour mixture out onto your prepared sheet pan. Spray your hands with non-stick cooking spray and use them to press the mixture into your sheet pan. 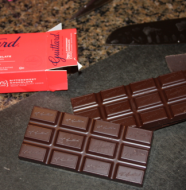 Turn your pan so that the short ends are at the top and bottom with the long edges on the sides. Leave about a 1 inch border at the bottom then make a horizontal line with your gummy worms. 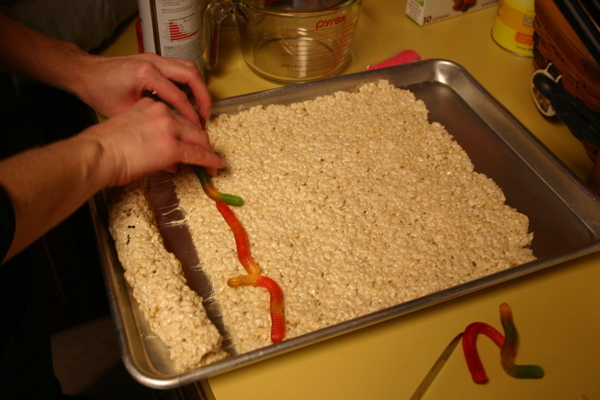 Wrap the bottom 1 inch border up and over the gummy worms and then cut the rice krispies treats when they are completely wrapped around the gummy worms, making logs out of them. 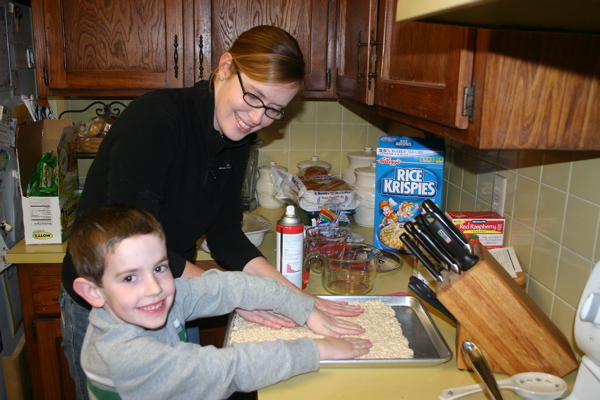 Repeat until you have used up all of the rice krispies mixture (about 5 logs). Now wrap the fruit roll-ups around the logs. 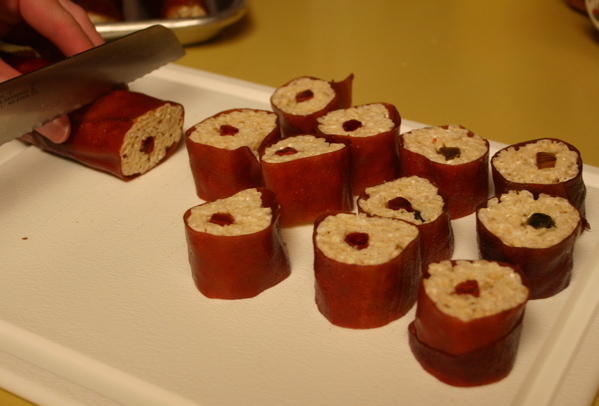 Cut each fruit roll-up wrapped log into 1-inch pieces. Serve cut side up. Gummy worms are at the center of this delicious treat. 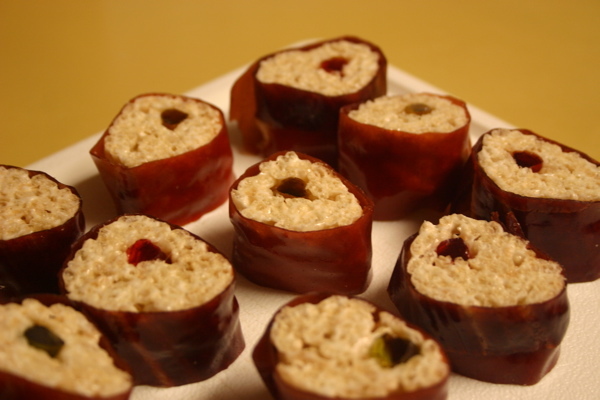 Roll the rice krispies treat around the gummy worm then slice the treat lengthwise. Here you can see all of our "sushi" rolls read for the final wrapping (a fruit roll-up). 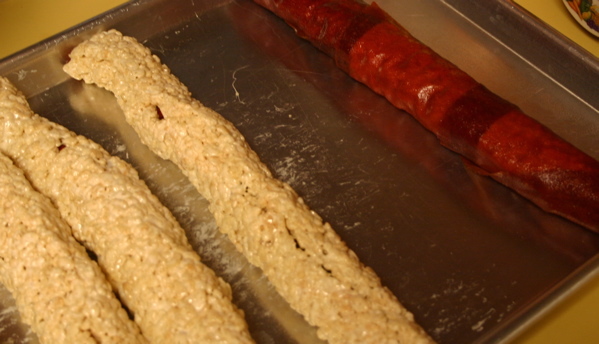 The first roll is finished. Slice the "sushi" rolls into one inch segments. 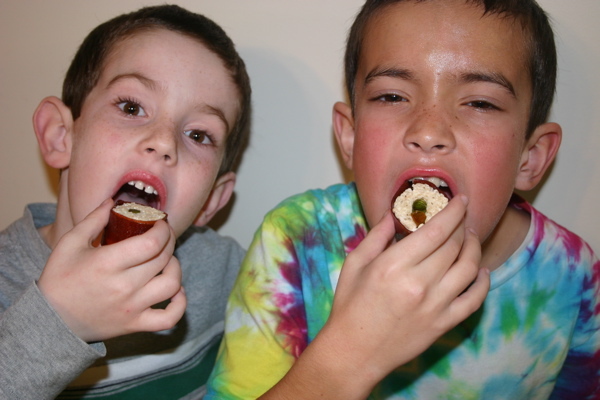 Can you imagine your kids wanting to eat sushi? The will want to eat these, and so will you! Even adults can enjoy this treat! 3 Comments on "Fruity Sushi"
LOVE THESE!! They are brilliant! I saw these and knew I had to make them for my son’s 7th birthday party. I used the brightly colored fruit roll-ups (as that was all my store had in stock). HUGE hit with the kids–HUGE! 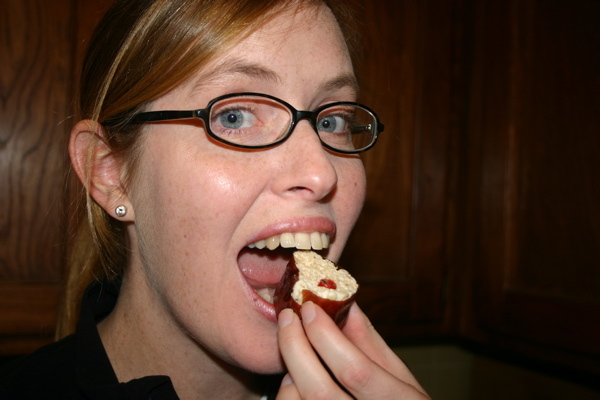 I thought the toughest part of the recipe was peeling the fruit roll-ups from the wrappers without tearing them. That was a job I gave to my husband (much more detailed oriented than I) and together, we conquered it. I put pictures of it on my Facebook page–very, very colorful!